I am a 62 year old female with first case of pink eye. I got it from an infected patient at a chiropractic office where I work. The doctor at the office also has had it. It's been 2 days of using ofloxacin drops. I also have thick nasal discharge and tenderness in neck/throat area. Probably I'll be going back to the doctor tomorrow. I'm very angry with this person who used public transportation to the office, infecting so many people and costing me all my personal/sick days! I had a hip replacement in June 2015. It's now near the end of February 2016 and I am still in pain when walking. The pain then causes me to limp. I am beginning to wish I never had the replacement. I have suffered with costochondritis for at least 4 years. I am in so much pain, this is the worst pain I have suffered. I am going to try heat pad, am on morphine, and tramadol. My heart goes out to my fellow suffers. I saw a nurse practitioner in a pain medical management office where I go due to severe back pain relating to scoliosis, DJD (degenerative joint disease), and several other spine conditions. She reduced my pain medicines and took my hand and prayed out loud for me! I go to a doctor for science, not religion! The office ladies told me I won't be seeing her on my next visit. I had been suffering with this condition for almost a month at that time. She didn't even name it. I ended up going to an urgent care after a few more weeks of intolerable pain. I am already on a muscle relaxer and 2 pain medicines and was bed bound due to torticollis. I was told by urgent care to stretch my neck and if it hurt I was doing it right. I wasn't even shown how to do stretches correctly. My chiropractor didn't even give it a name or prognosis other than, 'you are a mess!' Where have all the good doctors gone! I certainly hope others have better luck than I am having. I can't drive because I can't turn my head. It even hurts to brush my hair. Being a retired nurse I have lost faith in the medical system, especially if you are on Medicare. My 6-year-old son had pink eye. I took him to doctor and got eyedrops. His symptoms were gone in about five days. I thought we were all good, but then his sister got it, too, seven days later. I did not get pink-eye until I was an adult. I got it right after I had my thyroid removed and it was reoccurring. It was very severe in both eyes. Once I was able to stabilize my THS with the right dosage of Levothyroxine I no longer would get pink-eye .There are also other eye diseases that have similar symptoms that need to be diagnosed by an eye doctor , go to see one instead of a G.P. if you ever have what you think is pink-eye. My great-grandkids had pink eye, treated with Polysporin. 10 days later they met my son, who got pink eye 5 days later. He stayed with me the first 2 days, and now, 11 days after that, I have it. I'm 75 and never had it before. It started with my ten year old, he took prescribed eye drops and it cleared up. Ten days later, the five year old got pinkeye. Three days after that, I got pinkeye. Three days after that, my eighteen month old baby got it. This is in spite of using eye drops and a lot of handwashing. Most of us had mild to moderate cold symptoms as well. We went to San Diego with the high school band. One of the chaperones had pinkeye in both eyes so bad that she wore her sunglasses inside and outside for the first day and a half. About 10 days later, our son had a horrible cough/ cold and pinkeye. Five days later, my husband got a milder case of it. Now, five days later, I have it in both eyes, along with a sore throat and bad cough. All thanks to the "princess" that couldn't stay home when she should have. I've had pinkeye over and over in the past month. Like a fool, I continue to wear makeup. I ran out of the meds the doctor gave me. So I threw out all my makeup and bought new stuff and more drops (Polysporin Antibiotic Eye/Ear Drops). I haven't touched my new makeup yet – I refuse to until the pinkeye is cleared up, although it is very tempting. I also boiled all my shower stuff, including my eyelash crimper and tweezers, for at least an hour. I let my makeup case sit in very hot water to try to save what I can. I wash the door handles every day and change my bedding regularly. The latest time I got pinkeye, I was still using my old drops for at least a week. Now I've been using Polysporin drops for a week. I've read that pinkeye can last 7 to 14 days. My eyes aren't red anymore but I still get a tiny bit of discharge. When I put the drops in it causes an unbearable itch. I'm trying my best not to touch my eyes. I don't know if I should continue to use my drops or if this will cause more bacterial infection. I don't want to have to pay $75 to see the doctor again. I miss wearing makeup. The very next morning after my 15 month old had shown symptoms of pinkeye, my 2 year old did too. Now they're both home, I got the drops and I am trying to keep everything and everybody clean. I guess we will see if anyone else gets it too. I am hoping that I did not spread it at daycare. I got pink eye 14 days ago. It cleared without antibiotics in 5 days. Two days later my husband got it. It cleared up in three days. I woke up this morning and I have it again. And the symptoms are worse this time. The first time I had pinkeye, it did spread to others in my family, as I didn't know about it at all. But the second time I kept my hands really clean and took all precautions and ensured it didn't spread to anyone other than myself. Yes it's very, very, contagious on touch. And you have to make very sure you don't spread it or contribute to its spread. My son has pink eye. It has been going around the school. We are washing hands and all surfaces and towels, etc. We have four younger children. Warm Chamomile tea bags left on the eyes for 10 minutes multiple times a day do help. Dabbing a cotton ball in the tea and brushing the eye lid help for younger children who do not like to sit still. I got pinkeye about two weeks ago. When the heat came on my eyes would tear up. 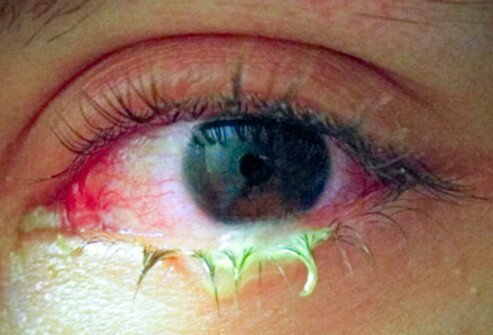 I tried allergy eye drops and that didn't help. I changed to hypo-allergenic mascara and my eyes watered more. Going without makeup was terrible and finally I succumbed to the doctor and got antibiotic drops which burned dreadfully. Now I am feeling better and hope that eye disease is gone forever. I am 62 and never had anything like this before. I may have gotten it from my grandchildren. My daughter had it 2 1/2 years ago when she had her 2nd baby. She couldn't see how to back up and hit a fence on her way to the hospital. Her episode lasted a week. Yes. 33 year old female, mother, had pink eye and now a week later the 3 year old female daughter has pink eye.